Bridger, that Charged Particle Reaction will spread the secondary deflector dot and the drain infection within the smaller CBPs? I mean, do the smaller CBP generated by the reaction also spread sec deflector dot and drain infection dot? I think it does, but I am not sure. Could the CBP be replaced with a BO and have Overwhelming force as a trait to start this and release another sci slot? You could replace Fire at Will I, with Overload I but than you would loos the bonus you get from ETM and Rifts do good damage. I seem to struggle with the amount of sci this ship has. I need more! I'm simply curious. I've switched away from temporal powers. I'm just using the heal/cleanse one to proc the chronos trait. Also not using intertwined matrix trait. I'm simply mixing and matching. My build for this is slightly more torp+sci+ctrlx oriented. It would help if you post some numbers like this. I take my parses from random people I queue with. Top parse was 125k. Dropping the entropy redis+deconstruction would be a 15k loss tops. I've realized that putting too many skills and too many dependencies for a 7k dps improvement simply takes away from the fun-to-perform factor. We could try an ISA when we're both online and see how my build does. Posted 1 Week Ago – Last edited by casualsto; 1 Week Ago. Amazing print. Thanks! It's the first time I see it all. That's post change. I gotta have a look at it. At the moment I've dropped the temp skills excepting the heal one to proc the chronos trait. 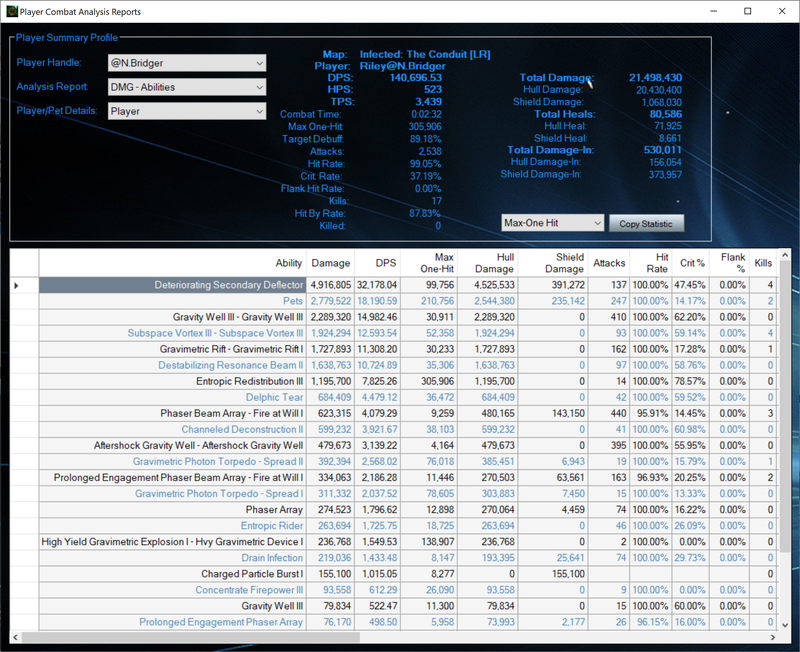 As I said, it's 7-8k dps difference if you remove the temporal damage skills, which at 125k+ dps is pretty marginal. I've replaced the temporal skills with a2sif1 and the engineering debuff that decreases kinetic resist on a target. Structural integrity collapse 3. Later update - I've switched back to temporal skills and more engineering focus and dropped drb1+po2 for now. Until a Verne is gonna fall out of the sky into my arms, getting an exclusively exotic ship is a hard endeavor. How goes the build Bridger, any more planned changes? Hehe... Why I 'figured' despite a 'rough' intro to forums, perhaps many Cardassians experience this; still I thought I saw a bit of Garak in you. Still a very respectable parse shown by another Officer of you. I'm sure that will have more watching your suggestions as well. 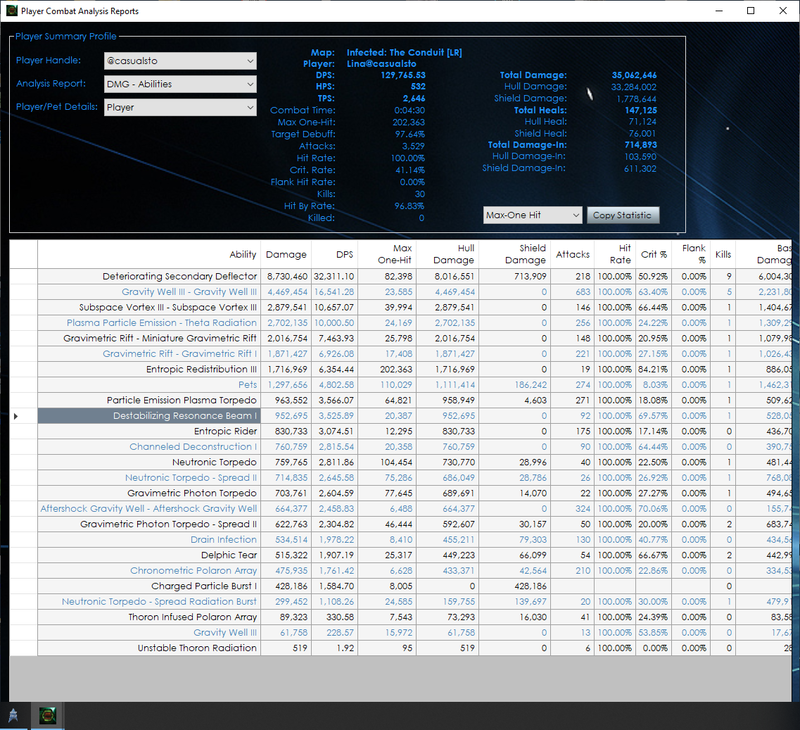 While there are some dedicated applications like DPSLEAGUE Combat Log Reader / CLR show there, I rarely run them or ones like it from SCM, as I'd rather prefer to use STO Academy Combat Log as it is run via webpage & easy to do. Even in a PUG, team plays a role and when you get people who can point their noses at 5 stationary targets and nuke them with CRF, ISA is not such a hard task. On the other hand, I'm working on 6 builds, one for each type of energy. I just gotta reach T6 in Undine, Lukari and Iconian reputations on 6 toons. I have a thing with not running my own parse. Call it a habit. The results posted by another user should always be legit. Back in the days, my first parse with my Reman character was a 34k that led to a long talk in the dps channels, so I stick to safe means of measurement. The results posted by another user should always be legit. I just had an ISA run where the parse difference was 20K, that is why you want to parse yourself.